It’s the sound of plastic scraping hollowly across blacktop that scares the hell out of me. Have I lost the bike? No, it’s my knee-puck giving notice that the 2006 Suzuki GSX-R 750 is on duty and making me look better than I am. Out of the corner of my eye I see photographer Kevin flinch a little in the middle of capturing a stream of motion shots. I’d just spent a good half hour over breakfast explaining how I wasn’t feeling quick today and not to expect anything special out of the photo session. 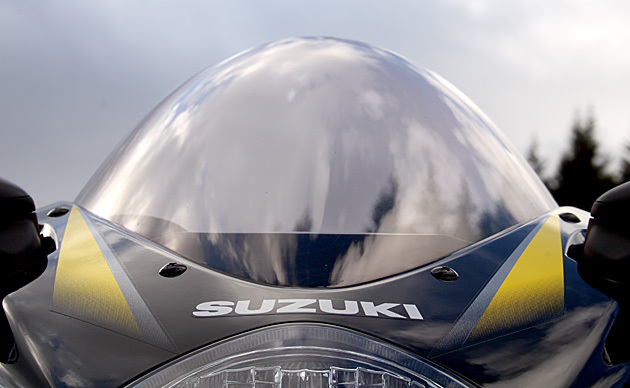 Precise, poised, controlled; the Suzuki GSX-R 750 feels like you could thread a needle with it, effortlessly turning all my excuses and posturing into so much wasted hot air. Pulling out of the corner the GSX-R 750 wails towards its 15,000RPM redline like a basso perfecto in exquisite hair pulling agony. 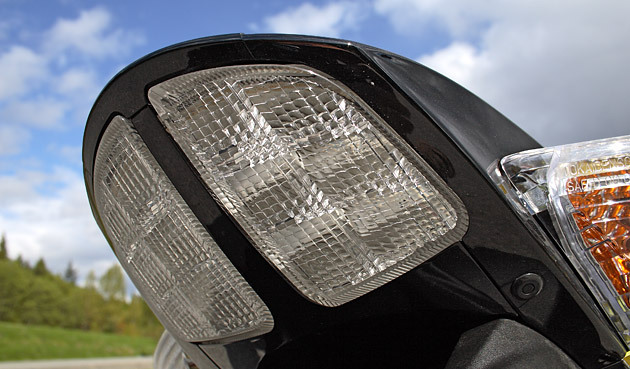 Had I done that on the GSX-R 1000 you’d likely not be reading more from me for several months, and on the 2006 GSX-R 600? The experience is not much different given that the K6 750 is the dimensional twin of the 600 to the millimeter – except coming into the corner would be a matter of hitting the right gear and spot in the power band at the right time. 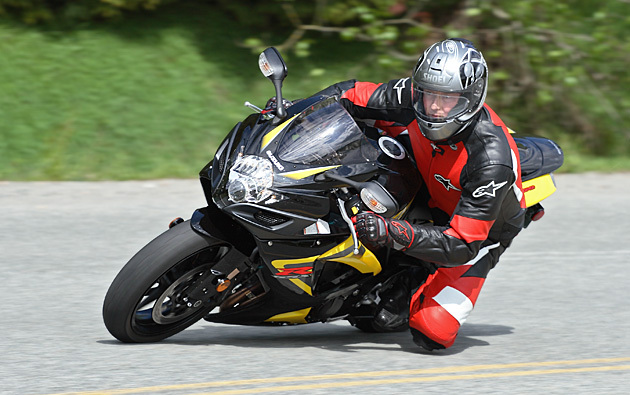 That makes the GSX-R 750 very special; it’s likely the best 600-class sportbike on the road. Being the identical twin to the GSX-R 600 in steering geometry, brakes, frame, wheels, seat and fairings might give the K6 GSX-R 750 a bit of an identity crisis. Under the fairing it’s a different story, while the 600 may have a flat stomach however, the 750 has been off to the gym building some serious muscular grunt – snapping to speed like a sprinter with shoulder wrenching zeal. At the crank the claimed output is a whopping 150hp at 12,000 RPM, with 55ft-lbs of torque coming on strong at 10,500RPM. Compare those figures to the Gixxer 600’s maximum 50ft-lbs of torque shoving in at 7000RPM, and peak claimed 124 crank horses at 13,500 RPM and there’s no mystery as to who has the better midrange. Whacking the throttle boldfaces the differences between the two bikes and opens up twin injectors, one manually controlled providing the bulk of the fuelling and one computer controlled fine tuning the control, both working in synchrony to keep things smooth and responsive. The 600 spins up effervescently wailing through the tach, ratios and speedo, while the 750 is more aggressive and purposeful. 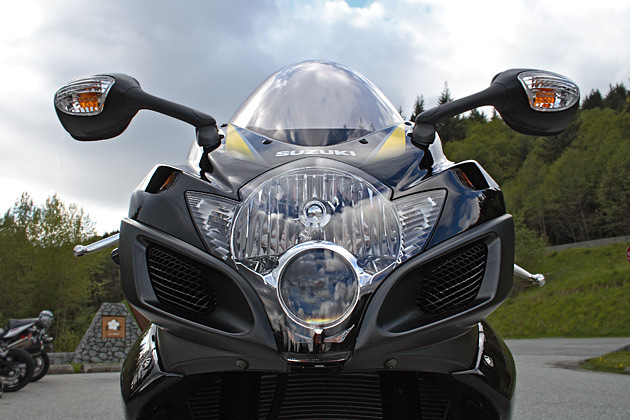 On the 750, passing 8000RPM you are up to speed faster than your license can be stamped with “Cancelled”. The GSX-R 750’s numbers come at a “cost” though; the bike comes in at 2kgs heavier than its 161kg little brother at 163kg dry. Muscle mass it seems does indeed weigh more. Out on the road those two kilograms completely fail to matter when the GSX-R 750’s greater flexibility and easier riding enter the equation – concerned about that weight? Skip the doughnuts and hit the protein shakes at the office. Where the 600 has generally only one gear that suites the occasion, the 750 is better natured letting you take you waft through the 50-marked twists in fourth, or scream through in second. Whatever the mood, this bike is willing to play. If you should choose to ride in traffic, heaven forbid, the compact ergos are pure wrist screaming sportbike hell till over 120kph, the 750’s midrange gives the bike a more lenient nature than the 600cc set. 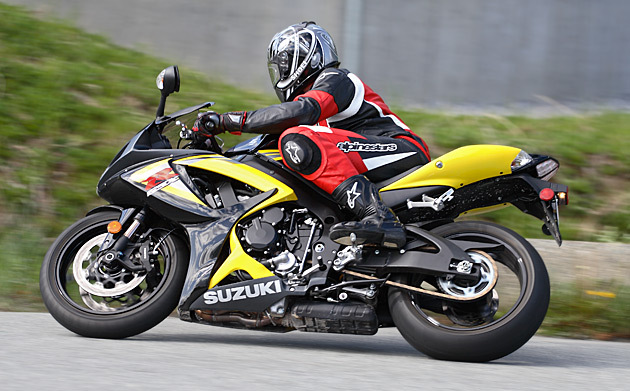 The K6 750 requires less play through Suzuki’s slick shifting 6-ratio transmission, and less spin to get up to power – by comparison the 600 feels like it’s come down with a case of anemia. This is all without the threat of getting pounded into a mash by the ‘roid-rage power of the litre class bikes… take your pick of which, because in the end they all make about as much sense on the road as gym bunny with 32-inch biceps wedged into a tutu. 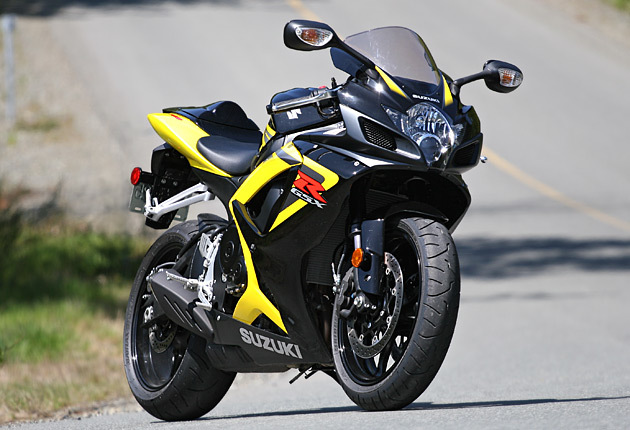 There is something else about riding through town on the GSX-R 750 that one needs to consider – the attention it draws. Part of it might be the throaty syncopated snarl stirring some deep limbic response in the 20-something brain. The other part might be the looks, subtle like a pouncing panther from the side and conveying vehement cycloptic villainy from the front. The experience turns the heads of the male “slacker” generation genus so quickly as to cause whiplash. Stop at an intersection by the local board shop and call the ambulance, ‘cause they will be walking into telephone poles. For the sake of those around me it was obvious the GSX-R 750 needed to be ridden in less urban environs. Thru the twists the GSX-R is stable, planted and composed. The suspension features a multiplicity of adjustments; preload, high and low speed compression damping, and rebound damping. Adjusting this is more mind-boggling than the list of ingredients on a semi-synthetic power bar. Those of us in the Clydesdale category at the local fun runs will find a bit more preload out back in order, lest the GSX-R 750 feel like a dog dragging its hind along the ground, Once the settings are right though, this bike shreds the corners with speed matching any 600-sport bike while force feeding you truckloads of confidence and assailing you with the stubby exhaust’s bellicose bray. As with the 600, drawing you down from that intoxicating bout of encroaching hearing loss are the twin 310mm disks and four? pistoned radial calipers providing strong and consistent braking. When it comes to ergonomics the K6 GSX-R 750’s are tighter than the previous year’s model, three-way adjustable pegs or no. Sitting on the K5 the bike feels like a sport tourer by comparison to the latest greatest. 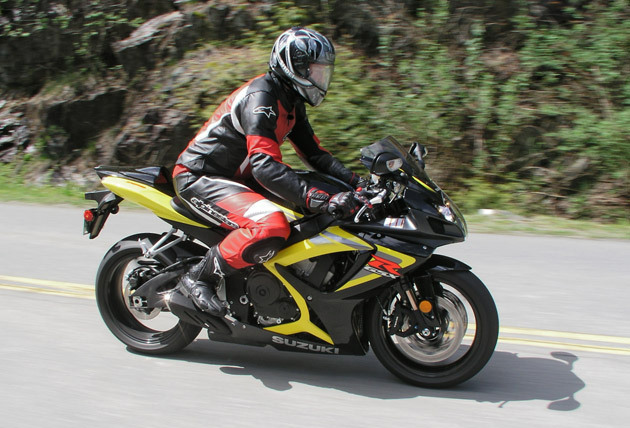 The ergonomics are something to keep in mind, because among the current crop of 2006 sport 600’s the GSX-R 750 (and by extension the 600) is fairly relaxed. Relaxed of course is a relative term; a bed of nails say is more comfortable than laying on red-hot coals, but then I’m sport touring biased. 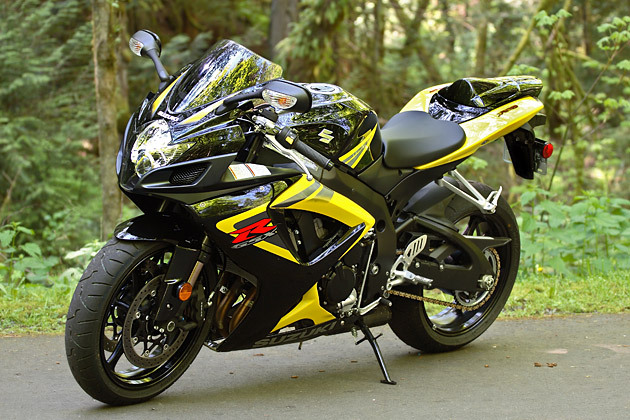 In reality, the GSX-R 750 could see you through the occasional aggressive tour like its bigger brother the 1000. Comfort is augmented by the smoothness of the engine; vibe is considerably reduced over the 600’s tingle through the pegs and bars. We followed the GSX-R 750 with a Bandit 1200 and the Honda VFR and frankly this engine keeps company with those bikes in the smooth category, though not as sedate by any means. 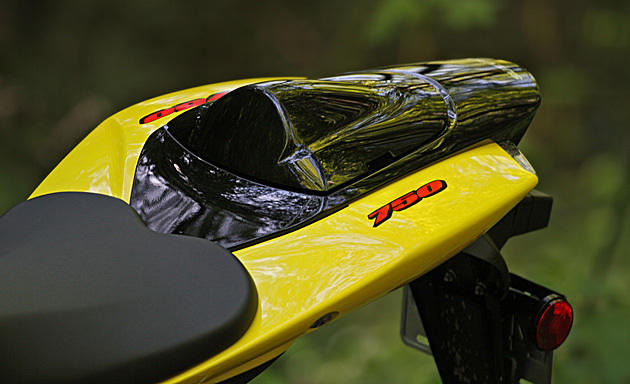 The airflow and weather protection is top notch for a sport bike, the stream over the windscreen is clean and buffet free and the fairings offer good protection. The tank at 16.5L leaves a bit to be desired on longer rides with the bike requiring periodic libations, the reserve coming on at around 120km consistently. You’ll not be carrying much on the bike in standard garb, with the under cowl (or pillion seat if you’re out to inflict pain on the unsuspecting) stowage requiring creativity to fit anything beyond the manual, a wallet and your cell. The real question here is what type of régime of engine modifications and performance enhancements would it take to move the 125hp GSX-R 600 up the scale to the 750’s 150? Could it be done for the $1200.00 difference in MSRPs with the 750 sitting at $12,999? At that difference a set of pipes feels like a mugging, unless you’re a “bling-it-on” type who needs the visual affirmation of power. Even if you could pull off such an upgrade it’s doubtful as to whether you’d be able to achieve the same mid-range grunt as the Suzuki GSX-R 750. That makes the choice pretty easy in my books, unless you absolutely crave the rev-happy effervescence of a 600cc sport bike, or you’re off to the races I’m hard pressed to see any reason not to go for the road usability of the GSX-R 750 over the 600. If you’re really concerned about being seen on a 600, you can always buy the stickers… you’ll be moving fast enough no one will be able to tell the difference between the two anyways.